The story of Granlibakken’s early days, as told by Kjell “Rusty” Rustad’s daughter, Binth Rustad. Granlibakken Tahoe today is a bustling conference center, lodge, and resort just outside of Tahoe City. The small ski and sled hill onsite is fun for beginners and families, and generations of skiers and snowboarders have earned their chops at Granlibakken’s historic slope. It’s not uncommon to talk to a local or a visitor to the area and hear that they first learned to ski or snowboard at Granlibakken. But when Kjell “Rusty” Rustad first leased the land that Granlibakken’s ski slope is situated on, it was a small operation. There were no structures onsite, and it was best known for the ski jump that had been built there for the 1932 Olympic Ski Jumping Trials and the 1932 National Ski Association Ski Jumping Tournament. 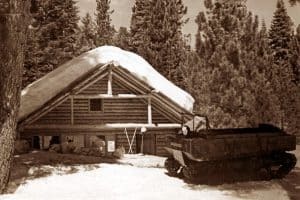 Rusty, together with his wife Marion, developed Granlibakken and gave it its name, which means “hill sheltered by fir trees.” Rusty built a log Ski Hut out of the trees that were cleared for the ski hill. He also built a house to live in and a duplex that slept 6 on each side for visitors. Rusty worked to further develop the ski area—he built 2 rope tows, expanded the terrain, groomed the slopes, and taught lessons to beginners and aspiring ski jumpers. Granlibakken is truly where the Rustad family made their mark in Tahoe. Binth’s mother and father, Marion and Kjell “Rusty” Rustad, first met on a trans-Atlantic voyage Marion, who hailed from Poughkeepsie, NY, was taking the voyage to Europe for a pleasure trip with some family and friends. En route she met Rusty, who was first mate on the Scandinavian ship line they were on. By the time that they had gotten to Norway, Marion and Rusty were in love. They married the same year that they met, Marion relocating to Oslo in December of 1937. While Rusty worked an additional year on the same line that they met on and was away often, Marion became fluent in Norwegian and fell in love with Norway. To shorten the time spent apart, Rusty become an officer on Hurtigruten line, Norway’s coastal express service, and they relocated to Stokmarknes, on one of the islands north of the Arctic Circle. Marion stayed there and Rusty commuted to Tromso when he was on duty. Marion and Rusty lived in Norway for a few years. When Norway surrendered to the Germans during WWII in 1940, Rusty was working in Tromso. He gave Marion 24 hours to get rid of all their possessions, including their dog and car. In those 24 hours, Marion also had to get across the fjords to Tromso where he had secured passage on a Red Cross ship leaving for England. Their daring escape from Norway is a story in itself-the ship they were on was shot down by German bombers. As they were loading into a lifeboat, it capsized, leaving the Rustads exposed to the bombers, who used the heads of those stranded in the icy water as target practice. They were fortunately rescued by passengers in other lifeboats, and then by a British destroyer—extremely lucky considering not only the threat of the German bombers, but also the freezing temperature of the water near the Arctic Circle. After escaping Norway, Marion and Rusty made their way to New York. They stayed with Marion’s mother in Nantucket for a brief time before moving west to San Francisco. Rusty got his US citizenship and at the start of the war found work as a supply officer. He worked alongside Marion’s brother, who was a navigator for PanAM, ferrying supplies from Treasure Island to U.S. troops in Hawaii. Binth, their daughter, was born in Oakland, but it wouldn’t be long until the Rustads relocated to North Lake Tahoe. 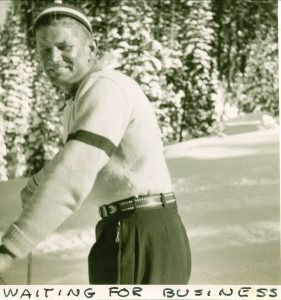 Wayne Poulson, who later became the founder of Papoose Mountain and Squaw Valley, was a pilot for PanAm, and spoke often to Rusty about the splendor of the Sierras-beautiful mountains encircling Lake Tahoe. According to Binth, Marion and Rusty “made their way up and decided that was where they wanted to live,” settling in North Lake Tahoe just a year and a half later. The mountains and the lake spoke to Rusty-marrying two of his passions, ski jumping and sailing. The Rustads spent the summer in Kings Beach, which was a popular boating community at the time, while house hunting in North Lake Tahoe. Rusty purchased a sailboat the next year, The Polaris, to interest people in sailing lessons on Lake Tahoe. Rusty was never a fan of motor boats, and played a major role in re-introducing sailing to Lake Tahoe. 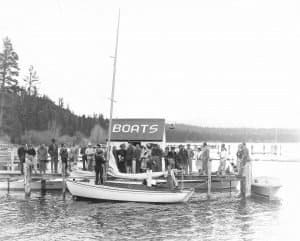 He chose a sturdy boat with a heavy keel, “you couldn’t tip her over,” Binth recalls, unlike Henry Kaiser’s catamaran, which once overturned in a strong gust on Lake Tahoe. Shortly after moving to North Tahoe, the Rustads moved into their first home in Tahoe Park, on Lake Tahoe’s west shore. The Polaris was anchored off-shore beside Sunnyside. Binth attended school in Tahoe City, and her memories are of long summer and winter afternoons spent in the mountains and in the woods. Marion and Binth on The Polaris on Lake Tahoe. Binth lived in Tahoe City, spending her time outdoors as much as possible, until her parents divorced when she was 10 years old. Tahoe City at that time was a small, tight-knit community of about 500 people. The closest “supermarket” was in Truckee, with the larger stores in Reno over an hours’ drive away on single lane highway. The elementary school was small, sometimes having to combine grades to make up sufficient class sizes. Marion, a former elementary school teacher, was actively involved in the PTA, and even gave Binth lessons at home prior to starting first grade. As a credit to this tight-knit community, Binth has remained friends with some of her elementary school pals. The local community really stretched from Kings Beach to Meeks Bay, with Tahoe City being a central hub for people to gather, shop, and go to school. In 1947, Rusty leased the land that the Granlibakken ski area is now situated on, and gave the ski area its name, “Granlibakken,” fitting for the north-facing slope sheltered by towering pine and fir trees. He cleared the slope for a ski hill and for a junior jump. 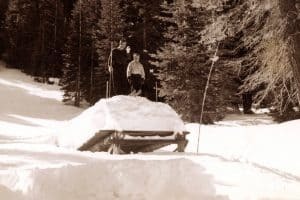 The log Ski Hut constructed with logs harvested from the ski hill is still in use today, and continues to provide a gathering place for skiers to warm up on a winter day. 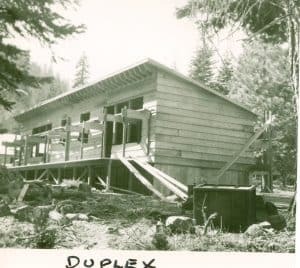 The Ski Hut also acted as the center of activity for the ski hill--a Jukebox was installed that allowed music to be played over the slopes, and Rusty and Marion sometimes entertained in the Ski Hut after-hours. Binth remembers, "As a teenager and adult, the ski hut was also a place to hang out at the end of the day, whether my step-brothers and I had been teaching skiing or just visiting. There were usually a lot of people around, talking, listening to music and even dancing. I was taught to polka one night, whirling around the fireplace by one of the family members of a dance troupe from San Francisco." The weasel, which was used to transport guests to Granlibakken Tahoe before a road was built. Binth Rustad describes growing up in Tahoe City at Granlibakken as idyllic—she would spend summers at Lake Tahoe and on the Truckee River, fishing for minnows off the Sunnyside pier while Rusty taught sailing. Occasionally, she would tube in the Truckee River, just a quarter mile from the Granlibakken Ski Hill. Winters were consumed by skiing at The Granlibakken ski area and Squaw Valley. Binth also spent winters helping her parents at Granlibakken, greeting people at the hut and telling them how to ski while whizzing by, which may not have always been appreciated, coming from a 6 yr old. However, people were good sports-Binth remembers that most laughed and some listened. Binth describes Granlibakken in its early years as a fairly bare-bones operation. A couple of rope tows, the old Olympic jump, a novice jumping area, a pond, the ski lodge, a duplex and their home made up the property. Once the structures were built, the Rustads lived in one—Binth describes it as basically a good size living room & kitchen area overlooking the ski slope where most of the living took place. The rest of the house contained a large bedroom and small nook in the corner where she slept, and one bathroom. It was fine living quarters for a small family, and the location overlooking the Granlibakken ski area couldn’t be beat. Marion, Binth’s mother, worked hard to keep Granlibakken operating. 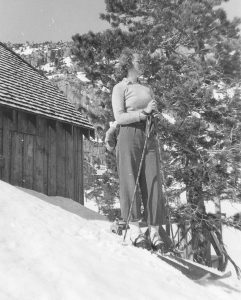 In the fall, she would calculate how much food, paper products, and essentials would be needed for the ski hut during the winter. Binth, Rusty, and Marion would all make the 2+ hour trek to Reno to pick up food and supplies for the winter—going to the butcher to purchase ground beef that Marion made into patties and froze for hungry skiers, and also purchasing enough plates, cutlery, and provisions to last the winter. 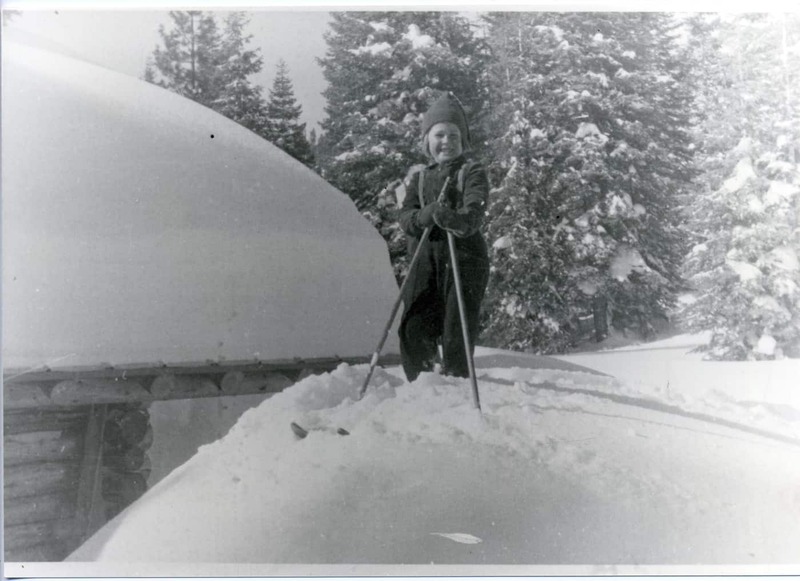 Marion managed the ski hut—even acting as the cook and cleaner in the early days. The Ski Hut was known for its Toas-Tites, a sort of sealed hot sandwich—perfect after a day of skiing. Binth described the Toas-Tite machine, “The top flipped up—two pieces of white bread filled with cheese and or chili on the bottom rounded bowl shape. Bring the top down, plug it in, and the heat toasts and seals it all around like around pocket sandwich.” How satisfying does that sound after a day of skiing? Marion was also in charge of cleaning and caring for the duplex that was rented out to seasonal visitors, and Binth recalls helping her make beds and clean toilets for incoming visitors. She says, “Bunk beds are not easy to make and hospital corners were mandatory.” Marion ran the operation like “a well-oiled machine,” Binth remembers. Marion also helped to get Granlibakken some recognition near and far—she wrote press releases, designed ads, and designed flags that introduced visitors to this small resort on the shores of Lake Tahoe. The first ski resorts in the region were up at Donner Summit, and many Bay Area winter visitors didn’t make the trek down to lake level. Marion, through her press efforts, played a part in changing that and was a part of the effort in putting Lake Tahoe on the map as a winter destination. Rusty, in the center, at the Granlibakken Ski Area. While Marion worked in the ski hut, duplexes, and as Granlibakken’s one-woman marketing department, Rusty managed the ski hill operations. The first year or two he picked up skiers at the highway in the Weasel, which was an old snowcat machine with tracks from WWII. In later years, once a road to the property was made, he plowed the Granlibakken road, groomed the hill, had floodlights installed for the ice-skating pond onsite, and taught ski and ski jumping lessons. 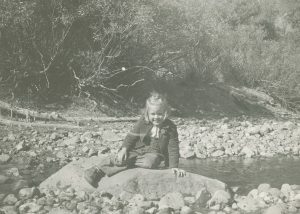 The Rustads dammed up the creek on property to make a pond for ice-skating but it was difficult to keep the snow off the ice; Binth says she recalls one high school skating night party during her time at Granlibakken, but the pond was often at the mercy of the weather. Rusty was also in charge of fixing the rope tow machines or re-splicing the rope when it frayed. 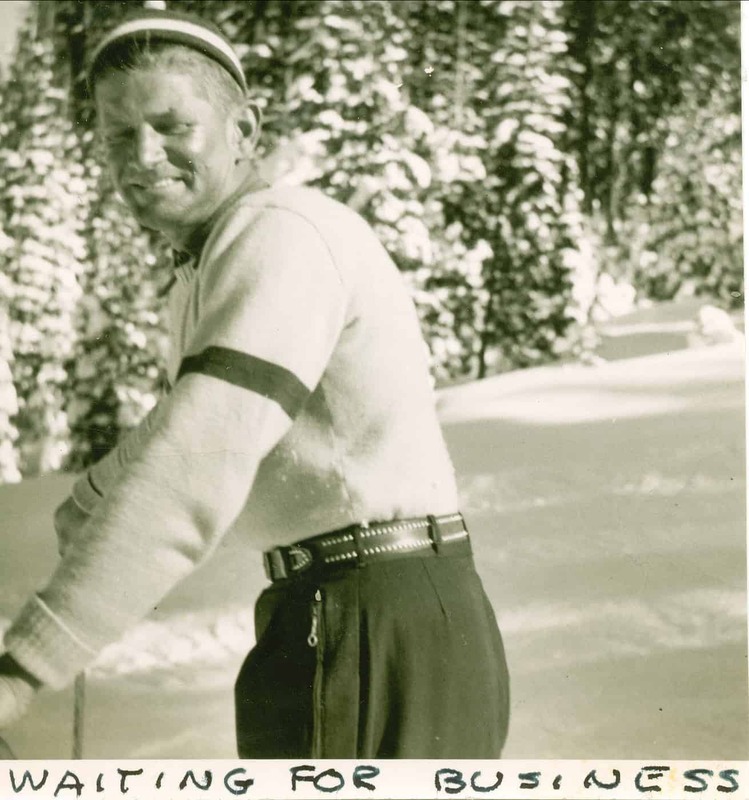 He oversaw and was very involved in the daily operations of the hill-from daily maintenance to guest relations. Rusty often became friends with visitors frequenting Granlibakken’s slopes—inviting them to hang out on the house deck or in the ski hut after hours. Binth remembers a few repeat visitors who became friends with the Rustads. Granlibakken was always a smaller ski area, but it had memorable character and charm. Rusty was quite a character and it showed when he wasn’t working. Before a jumping tournament at what was then called the “Olympic Hill”, Rusty lead with an exhibition jump wearing a hula skirt and lei. Binth remembers skiing on Easter, which the Rustads turned into a spring skiing celebration. Skiers would flock to the slopes, dressed in wild costumes and crazy hats, to ski easy races in the warm spring weather. The Easter celebration played into Marion’s love of theater—Binth remembers the many carefully and artfully crafted Halloween costumes that her mother made for her over the years. She won costume competitions in the local parade a couple of times. A couple of costumes that stand out in Binth’s mind were an authentic Norwegian outfit and a medieval princess costume. Marion passed her love of dressing up to Binth—Binth still enjoys a fun hat, or dressing up in costume. Easter wasn’t the only holiday that The Rustads worked. They rarely had true leisure time, and worked hard to make Granlibakken a successful and sustainable operation. Binth remembers going out into the woods around Christmastime to pick out a tree, “I would be sent out to scout the hills for a good tree for our house. At the end of the day, when my father had time, we’d go off to see what I had found, a saw hanging over his shoulder. Most often, we’d come back with a tree for us and others marked to give to family and friends. After I had moved East with my mother and was in boarding school in Maine, I received a tree wrapped like a mummy in old parachutes from Stead Air Force Base in Reno to remind me of ‘home.’” The Rustads, so as not to interfere with Christmas ski business, always celebrated their Norwegian Christmas on Christmas Eve. 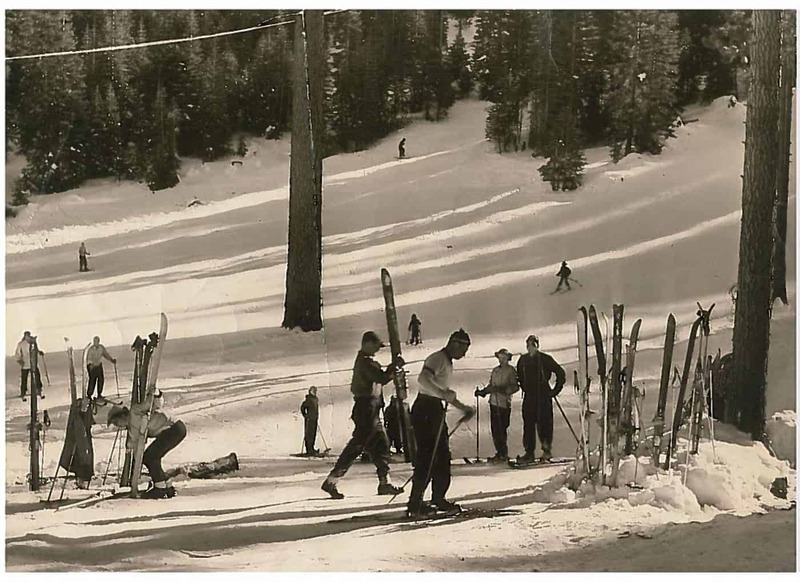 Skiing—both cross-country and downhill, was the winter sport of choice for youngsters in Tahoe at that time. The elementary school would head up to the mountain twice per week—the beginners heading to Granlibakken to practice their turns on the smaller slopes. Once they were more practiced they would ski at Squaw. Binth describes the Lake Tahoe Ski Club as a very serious and focused club, churning out racers and jumpers who competed on national and sometimes international stages. Tahoe City families were hard working and it was a sacrifice to take time off to drive their families somewhere. 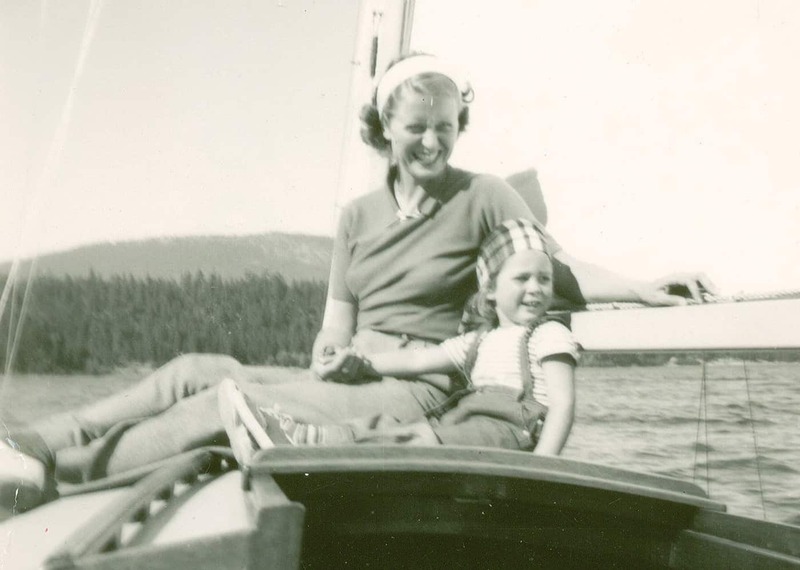 Binth remembers her mother taking her to ski meets in South Tahoe, Yosemite, Mammoth, and Sugar Bowl while her father stayed at Granlibakken to manage the daily operations of the resort. Binth hanging out at the Granlibakken ski hut after a big snow. Binth doesn’t even remember learning to ski—she has been skiing since she was two years old. She learned to ski before she even had mastered walking. Her father used to tell a story—Binth, as a young child, was showing off, going fast down Granlibakken slopes. 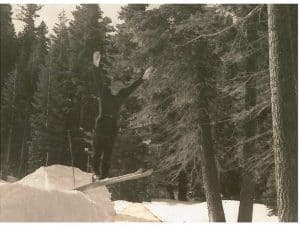 There used to be a huge tree in the bottom-center of the slope, and during spring skiing, Binth was schussing and despite the warming, she hit soft snow. Her skis stopped, but she didn’t—causing her to fall head first right into the deep snow of the tree-well under the tree, in front of everyone at Granlibakken. It always made Rusty laugh to recount that story. 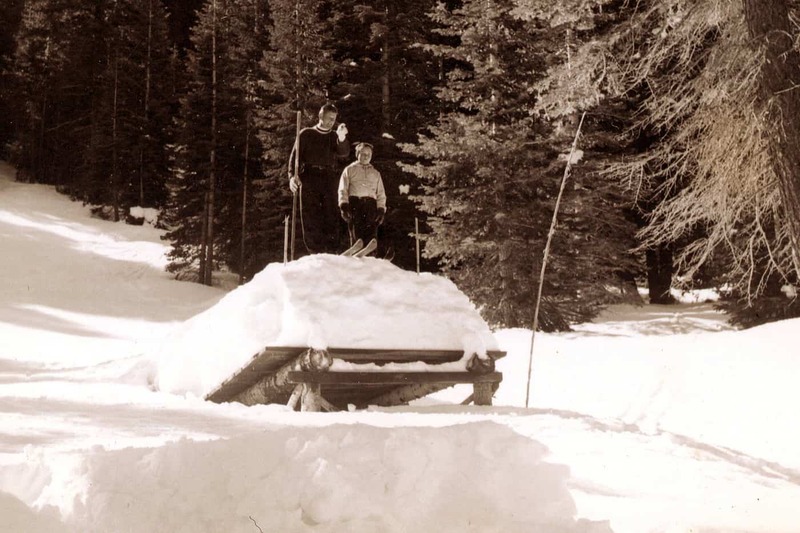 The skis that they used back then were big—there was no snowplowing. She remembers when she was older, at the height of 5’3”, her skis were a full 12” taller than she was. Old habits die hard—Binth says that she still gets nervous on shorter, lighter skis-she feels more confident with heavier skis. Rusty even had a pair of 12’ jumping skis that he kept around—huge wooden skis. Rusty competed in ski jumping in Norway, and went on to share his ski jumping knowledge with aspiring young competitors in Tahoe. Binth has visited the jump in Oslo where Rusty competed in the 30s and 40s, with the entire city spread out below the jump. Rusty teaching technique to a young ski jumper on the novice jump at Granlibakken. Granlibakken did have 2 ski jumps onsite in the 40s through the 60s. 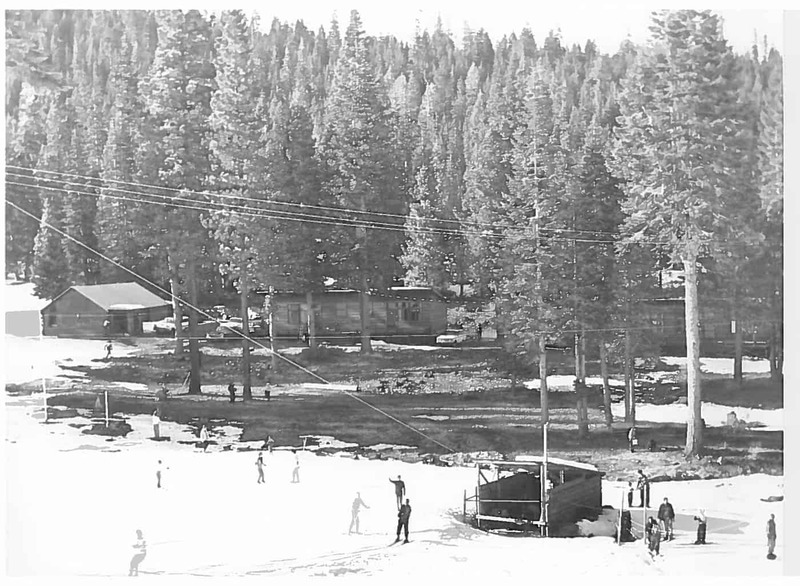 Although Binth was never very into jumping, it was a popular area for the Lake Tahoe Ski Club to practice, and a novice jump onsite was a great place for young skiers to learn techniques. In 1952, Granlibakken was the host to the Junior Ski Jumping Tournament hosted by the National Ski Area Association. Binth competed once in a local ski jumping meet. She won 10th place, and received a ribbon, but she preferred making turns rather than flying through the air. She recalls that her step-brothers, Rusty’s children with his second wife Jeanette, were very good ski jumpers. Tahoe City’s early full-time settlers were a self-sufficient group of people, and Binth was no different. She says of growing up at Granlibakken, “It was great, I loved it—you come home from school, I was an only child and my parents were very busy, so I’d be out there on my skis or climbing around up in the hills when the rope tow wasn’t working. 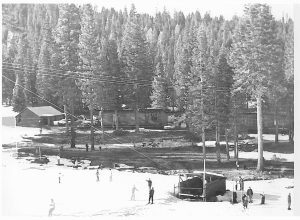 It was a great place to be a kid-we had the Truckee River so we could go tubing. We had the lake where my father would teach sailing. My dog would go everywhere with me when I explored the hills and found natural tree forts.” There were deer paths, and the only roads were the forest service roads including the one Rusty enlarged when he built the bridge across the Truckee. Looking down the slope at the Granlibakken Ski Area. Binth has fond memories year-round of her time at Granlibakken. From skiing down the slopes to tubing on the Truckee River, she says she wouldn’t trade her childhood for anything. There was the freedom to be a kid, get into scrapes and learn how to get out of them in the woods around Granlibakken. Granlibakken today still holds that charm—although a bit more supervised. In the winter months, it becomes a winter wonderland and place where families flock to enjoy the snow and each other. In the summer months, the hiking trails and access to the outdoors make it the perfect place for families and groups alike to bond and to explore. Many things have changed over the years, but one thing remains the same—Granlibakken is still a special place, where fond memories are made no matter the season. Wow love the old photos they are amazing. I bet it was incredible living in Tahoe back in those times. Thanks for the great blog post!